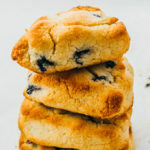 Cute blueberry scones made with almond flour, cream, and a sugar free sweetener. Low carb, keto, and gluten free. Position a rack in the center of the oven. Preheat to 350 F. Prepare a baking tray lined with parchment paper or nonstick baking mat. In a bowl, add dry ingredients (almond flour, sweetener, coconut flour, baking powder, salt). Whisk until well-mixed. Add heavy cream to the bowl. Stir together until absorbed and the mixture forms into a cohesive dough. Divide the dough into 6 equal pieces. Form into wedge or triangle shapes. Space them out by 2-3 inches on the lined baking tray. Bake at 350 F until the scones are lightly golden, 15 to 20 minutes. This recipe yields 2.5 g net carbs per serving (1 small scone or 1/6 of the recipe).